Great news for airplane enthusiasts, along with those of us who have our heads in the clouds: the Fort Lauderdale Air Show is back this weekend, May 7th – 8th. For the last two years, it has been missing from the May line- up of events. The primary reason for its disappearance was originally legal challenges (not related to the air show) that faced the primary sponsor, along with a sluggish economy. This year’s show is set to provide a great deal of entertainment that will include a never before seen aircraft, the F-35 Lightning II, also known as the Joint Strike Fighter. The single engine, one seater stealth fighter will be doing a fly over on both days. Additional flight performances will include a variety of well known and not so well known demonstrations. There will be a skydiving exhibition from The Lucas Oil Jump Team- a team of civilian skydivers who have hit the silk more than 30,000 times. The performance of the Canadian Air Force Snowbirds will honor the 75th Anniversary of the British Commonwealth Air Training plan. The aerial acrobatics of the AV-8B Harrier , F-18 Hornet demonstrations will definitely not disappoint. The Breitling Jet Team, the largest civilian team that performs in jets, will also exhibit their talents. The day will end with a flourish around 3PM. That’s when the fabulous Thunderbirds Team, the US Air Force exhibition group established in 1953, will delight the crowd with close formations and contrails. Gates will open at 9AM The Fort Lauderdale Air Show Fly Over begins at noon on Saturday, May 7th and 11 AM Sunday, May 8th. The viewing area is at State Road A1A between Sunrise Boulevard and NE 14th Court. The area known as Drop Zone Beach will be marked off and provide the best viewing opportunity for spectators. Audio commentary broadcast from the Drop Zone will provide real time description of the performances. Food and beverages will be available for purchase. This is a family friendly event worth the short drive to Fort Lauderdale. Tickets are $34 for adults and $22 for children (6-12). Kids under 5 are free. For complete ticket information click here. 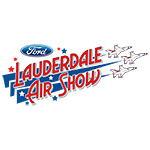 If you happen to go to the Fort Lauderdale Air Show, we would love to get feedback on this much anticipated event.